Salt Spring team the best in B.C. Salt Spring A's, the U11 AA B.C. champions following a tournament in Comox on the August long weekend. The “Comeback Kids” from Salt Spring accomplished what no other island baseball team had ever done before by winning the provincial gold medal at the BC Baseball U-11 AA tournament in Comox from Aug. 2 to 5. It was an amazing performance by the team, whose members range in age from eight to 11 years old. The A’s started the tournament strong on opening night by winning two of the four skills competitions at the opening ceremonies on Thursday. Sisaye Patterson won the prestigious Home Run Derby Award, much to the delight of the crowd and his fellow teammates. Competition was strong at this year’s tournament, and included teams from Ladysmith, Comox, the Lower Mainland, Sunshine Coast and Penticton. Despite a very strong pitching performance from Jackson Lange, the Salt Spring boys lost the opener to North Delta by a score of 5-2. Nate Gibson was recognized for his great hustle throughout the game. The team bounced back with a gutsy performance to defeat White Rock 8-4 in Game 2. Game 3 was against Comox, and the A’s found themselves down 7-1 early, but as they have done all season, they chipped away at the deficit and came out on top with an 11-7 victory. It was a stellar performance by pitchers Tegel Paulker-Hoover and Patterson. The final game in the round-robin portion of the tournament versus the Burnaby Braves was a heartbreaker, as the A’s lost 5-4 in extra innings, despite solid pitching by Sean Anderson. After round-robin play, the A’s were second in their pool and had to face the powerhouse team from Ladysmith, whom they had battled throughout the regular season. Ladysmith had not lost a game in the Comox tournament. In their strongest performance of the weekend, the A’s won 8-6, behind strong pitching by Nick Dawson and Flynn Shugar, and Antoine Gonzalez was incredible in the field. The A’s were never behind in this one, and won it in the final inning when catcher Nolan Boivin and first baseman Boone Harris scored following a pair of solid hits. We were off to the finals! The gold-medal game against the Burnaby Braves was one for the ages, and included an incredible relief pitching performance by Easton McDougall. The A’s were behind until the final inning, when a walk-off single by Pauker-Hoover drove in Nolan Langdon from third base with the winning run. It was a dramatic finish, and one that the boys will never forget. The Comeback Kids showed incredible grit and determination throughout the provincials, and have made Salt Spring proud. The Salt Spring A’s and coaches — Colin McDougall, Tom Langdon, Jude Shugar and myself, Tom Boivin — thank the Salt Spring Baseball Association, parents and sponsors for supporting the team this summer. 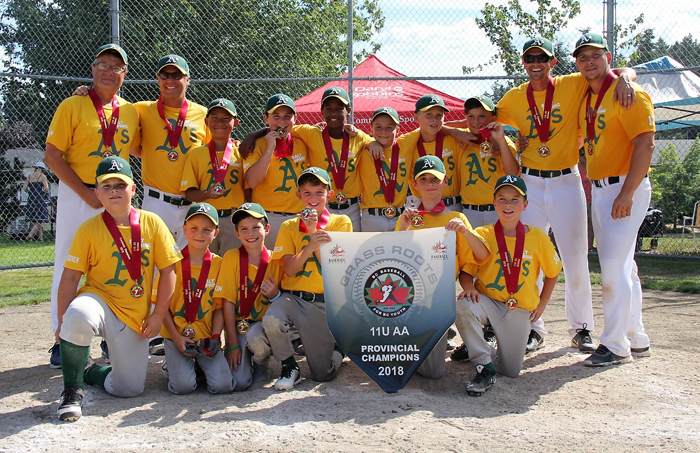 Last year, Salt Spring’s U-11 team won the bronze medal at the provincials.